Andy Wright, Ben Wiggett and Simon “Bassline” Smith aka Drumsound & Bassline Smith have just completed their album 'Wall Of Sound', which will be released on July 15 on New State Music. 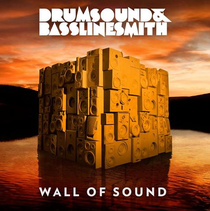 Although D&B in tempo, it's shot through with the buzz and dynamics of modern electro, trap, a smattering of 4/4 and dubstep – a style whose half-step rhythms “re-wrote the rules of what could work in a club”, says Smith. The singles on the album are each with a different guest collaborator: the post-Radiohead drama of Tom Cane's croon on 'Through The Night' and the alt rock of Hadouken! on 'Daylight', each touch on indie rock but in contrasting ways. Compare that to the soul power of Fleur’s vocal on 'One In A Million’, alongside ‘U Ain’t For Me’ featuring the Youngman and you can see how each has its own distinct style on the album. “With each singer,” remembers Smith, “we had to listen to their character, get the mood of what they did, and keep that but also transform it to become a part of our thing too.” Elsewhere on the album you'll hear old skool hip-hop via Bam from Jungle Brothers on D&B cut ‘All Day’, Daft Punk vocoders on 'Freak' and the Sam Frank powered ‘Atmosphere’, rave pianos on 'Pull It Up Selector' and even pop-trance on 'Close'. That coherence is achieved by the trio's production skills, honed through years of hard graft, but also by their deep roots in the purist drum'n'bass scene through which they came up, with the thrilling rushes, adrenaline-pumping velocity and sudden drops which only that style can really provide. “We don't think of ourselves as songwriters;” says Wright; “we still build tracks the same way we always did, thinking of the intro, the drop, the bassline, and how people will react to them in the dance. The vocal, the chords and the melody become another part of that, not something to sit on top of the backing, but something we have to work into our tunes so it works as part of the whole.” And it's this technique that has allowed them to create songs with more crossover potential and more flexibility, without ever selling out their roots or soundsystem power.